This is an excerpt from a recent addition to the Geek’s Cookbook, a design for the use of an external load balancer to provide ingress access to containers running in a Kubernetes cluster. For implementation details, see this loadbalancer recipe. 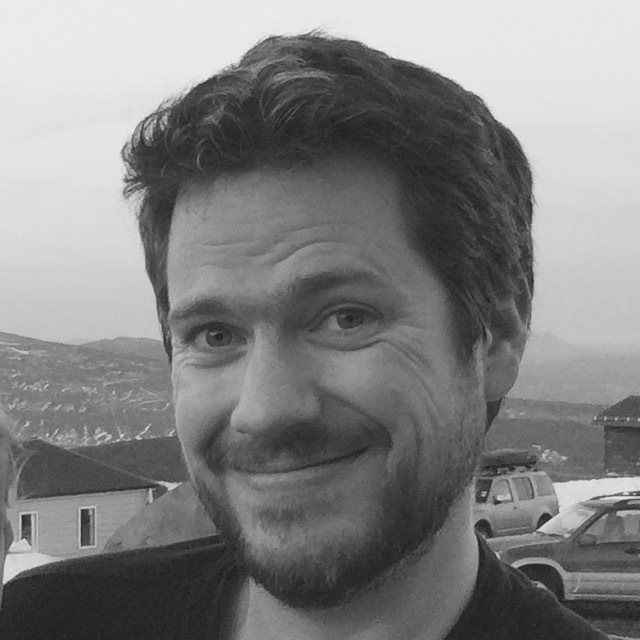 HostIP: Map a port on the host to a service. This is analogous to Docker’s port exposure, but lacking in that it restricts us to one host port per-container, and it’s not possible to anticipate which of your Kubernetes hosts is running a given container. 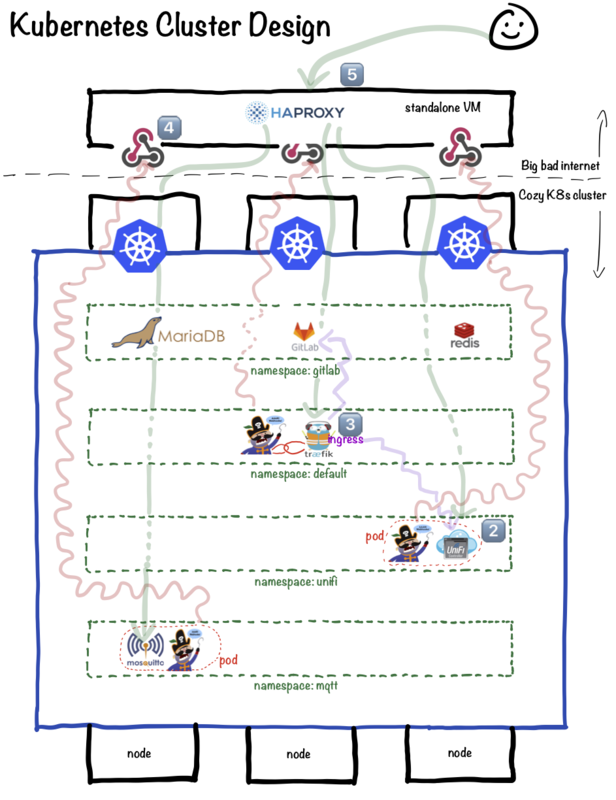 Kubernetes does not have Docker Swarm’s “routing mesh”, allowing for simple load-balancing of incoming connections. NodePort: Expose our service as a port (between 30000-32767) on the host which happens to be running the service. This is challenging because you might want to expose port 443, but that’s not possible with NodePort. To further complicate options #1 and #3 above, our cloud provider may, without notice, change the IP of the host running your containers (O hai, Google!). Our solution to these challenges is to employ a simple-but-effective solution which places an HAProxy instance in front of the services exposed by NodePort. For example, this allows us to expose a container on 443 as NodePort 30443, and to cause HAProxy to listen on port 443, and forward all requests to our Node’s IP on port 30443, after which it’ll be forwarded onto our container on the original port 443. We use a phone-home container, which calls a simple webhook on our haproxy VM, advising HAProxy to update its backend for the calling IP. This means that when our provider changes the host’s IP, we automatically update HAProxy and keep-on-truckin’! So what’s happening in the diagram above? I’m glad you asked - let’s go through it! In the diagram, we have a Kubernetes cluster comprised of 3 nodes. You’ll notice that there’s no visible master node. This is because most cloud providers will give you “free” master node, but you don’t get to access it. The master node is just a part of the Kubernetes “as-a-service” which you’re purchasing. Outside of our cluster (could be anywhere on the internet) is a single VM servicing as a load-balancer, running HAProxy and a webhook service. This load-balancer is described in detail, in its own section, but what’s important up-front is that this VM is the only element of the design for which we need to provide a fixed IP address. In the “mqtt” namespace, we have a single pod, running 2 containers - the mqtt broker, and a “phone-home” container. Why 2 containers in one pod, instead of 2 independent pods? Because all the containers in a pod are always run on the same physical host. We’re using the phone-home container as a simple way to call a webhook on the not-in-the-cluster VM. The phone-home container calls the webhook, and tells HAProxy to listen on port 8443, and to forward any incoming requests to port 30843 (within the NodePort range) on the IP of the host running the container (and because of the pod, tho phone-home container is guaranteed to be on the same host as the MQTT container). In the “default” namespace, we have a Traefik “Ingress Controller”. An Ingress controller is a way to use a single port (say, 443) plus some intelligence (say, a defined mapping of URLs to services) to route incoming requests to the appropriate containers (via services). Basically, the Trafeik ingress does what Traefik does for us under Docker Swarm. What’s happening in the diagram is that a phone-home pod is tied to the traefik pod using affinity, so that both containers will be executed on the same host. Again, the phone-home container calls a webhook on the HAProxy VM, auto-configuring HAproxy to send any HTTPs traffic to its calling address and customer NodePort port number. What’s happening in the UniFi pod is a combination of #1 and #2 above. UniFi controller provides a webUI (typically 8443, but we serve it via Traefik on 443), plus some extra ports for device adoption, which are using a proprietary protocol, and can’t be proxied with Traefik. To make both the webUI and the adoption ports work, we use a combination of an ingress for the webUI (see #2 above), and a phone-home container to tell HAProxy to forward port 8080 (the adoption port) directly to the host, using a NodePort-exposed service. This allows us to retain the use of a single IP for all controller functions, as accessed outside of the cluster. Each phone-home container is calling a webhook on the HAProxy VM, secured with a secret shared token. The phone-home container passes the desired frontend port (i.e., 443), the corresponding NodeIP port (i.e., 30443), and the node’s current public IP address. The webhook uses the provided details to update HAProxy for the combination of values, validate the config, and then restart HAProxy. Finally, the DNS for all externally-accessible services is pointed to the IP of the HAProxy VM. On receiving an inbound request (be it port 443, 8080, or anything else configured), HAProxy will forward the request to the IP and NodePort port learned from the phone-home container.